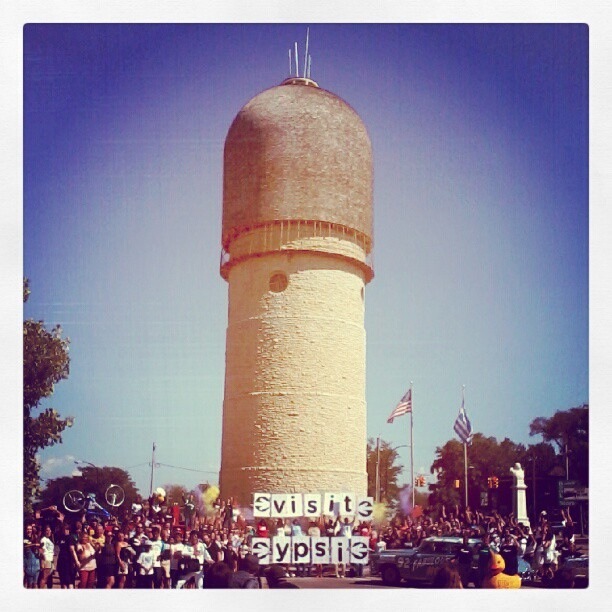 In the summer of 2012 Ypsilanti had the opportunity to star with 49 other destinations in a statewide promotional music video as part of the Pure Michigan tourism campaign. All I knew was that the music video was a modified version of the song Good Time by Owl City and Carly Rae Jepsen. Ypsilanti has many iconic events and buildings, but the historic Ypsilanti Water Tower was an obvious choice for a backdrop for our shot. Once I had the backdrop I figured I might as well fill the shot with everyone in Ypsi. I organized a “flash mob” via a Facebook event page and a press release to the local media. Our short video clip features: Eastern Michigan University cheerleaders and the mascot Swoop, a firetruck from the Michigan Firehouse Museum, the Hudson Hornet from the Ypsilanti Automotive Heritage Museum, a giant rubber ducky from the Ypsilanti Heritage Festival, and – last but not least – Elvis from the Michigan Elvis Festival. A local restaurant even closed early so the staff could dress up in togas and be a part of the shoot. The event was open to the public and I estimate we had more than 100 participants attend the shoot, which lasted about two hours. A lot of work went into planning but I won’t bore you with the details. The feedback from the community was very positive and that’s all that matters. The Ypsilanti shot is the second to last city at minute 3:20.